Men of the ocean, father and son Brock Callen. On a recent morning Brock Callen junior was sitting in the Sail Martha’s Vineyard office, still salty from a kiteboard ride at Philbin Beach. Whatever the season or the weather, he will find time to be in the ocean. His father, Brock Callen senior, was in the office too. As head of Sail Martha’s Vineyard he is no stranger to the sea either. In fact, his first mode of transportation as a child was a skiff. 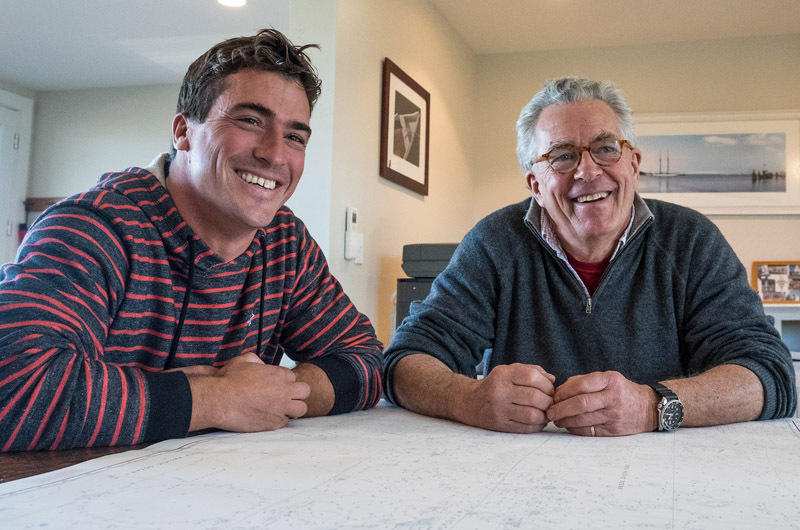 The father and son team were talking about an upcoming trip they will be taking together beginning Dec. 27, when they board the Schmidt Ocean Institute’s research vessel Falkor for a three-week research mission. They will join five other non-standing crew members including artists and educators, to assist in mapping three to four seamounts off the Johnston Atoll. The mapping project will be led by John Smith and his team from the University of Hawaii and will help plan for remotely-operated vehicle explorations in 2017. The Schmidt Ocean Institute is a nonprofit private foundation that focuses on ocean exploration through technological advances with the open sharing of information. They have used the Falkor for 30 cruises, covering 154,000 kilometers of sea since 2012. It is a trip of a lifetime, but there is one catch. There will be no swimming or water sports of any kind, a definite hardship for Brock junior. “I’m like already packing my bags, okay I can bring a kite and I wonder if a paddle board, and they were like, oh, by the way you can’t get in the water,” Brock junior said. The 272-foot Falkor is one of the Schmidt Ocean Institute’s most advanced tools for research. With advanced sonar systems, the crew and researchers aboard the Falkor can map both shallow and deep sea floors. During the three weeks the Callens will be aboard, the Falkor will travel from Guam to Honolulu covering about 4,000 miles. Brock junior, a professional ocean athlete, has been involved with the Schmidt Family Foundation as an 11th Hour Racing ambassador. As a member of the 11th Hour racing team, he raises awareness about sustainability through sailing. Last year, he attended a presentation about the ocean institute and the Falkor and it piqued his interest. “The more I saw about it, the more I thought I want to go on this trip, it looks too cool,” Brock junior said. He’s spent a fair amount of time at sea before, competing in the Transpac race from Los Angeles, Calif. to Hawaii, but that was only 2,400 miles. This next trip will add another notch in his ocean exploration belt. “This will be kind of cool because that’s a good portion of the Pacific to have crossed,” he said. Artists, students, engineers, scientist and educators regularly join the crew aboard the Falkor, and young Brock pitched doing the trip with a group of ocean athletes. But for the Guam-to-Honolulu cruise, there were only two berths available. The institute asked him who he thought would be a good fit. “I put out a couple names, including Senior here, and they immediately came back and said yeah...you guys have to go do this together,” he said. After all, they are a good team. “We’ve done so much together,” his father said. 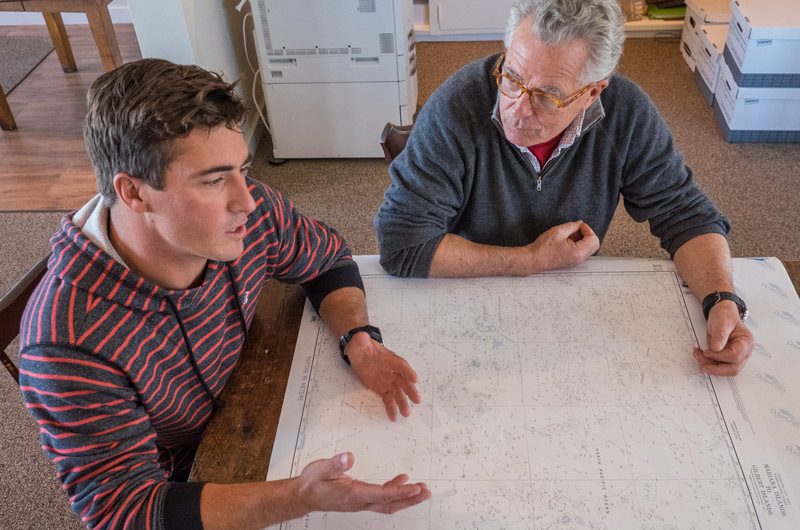 Over the years, as executive director of Sail Martha’s Vineyard, Mr. Callen has introduced countless kids to sailing and life on the ocean. He also teaches a class in maritime sciences at the regional high school. As an educator, Mr. Callen immediately saw the benefit his joining the Falkor crew could have for his students. The Callens won’t be promotional accessories on the ship; they will be absorbed into the crew and assigned to the major mapping project. “We’ll serve watches like any other member of the crew,” said Mr. Callen. They will also be members of Mr. Smith’s team, helping to conduct multibeam mapping and magnetic surveys. Being a part of the crew and the research project provides the grounding for Mr. Callen to teach remote classes, exploring different aspects of the ship, the research and the ocean. Since the classes are virtual, students from the Dominican Republic, Milton Public school systems and possibly the UK and Japan will be able to tune in to the lessons. The Callens will also be students. I can't imagine two better qualified guys to take on this project. Godspeed Brock and Brocker!! Lots of Callen's in the news this week! Kudos to you two - and to Alixe! Wow! What a score! That's a fantastic ship. I did a hydrography cruise on NOAA Ship Rainier as a Teacher atSea in Alaska in uncharted waters. Best adventure! Safe travels to you!! Godspeed gentleman! Love ya both. What a phenomenal adventure! All aspects of this are fabulous. Living life to the fullest! !